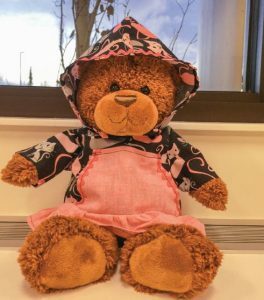 In addition to stockings and quilts, Pediatric Christmas Project volunteers create mini kuspuks for stuffed bears that are given to children who are admitted at the Alaska Native Medical Center over the holidays. Many children who are admitted at the Alaska Native Medical Center over the holidays will enjoy homemade crafts for Christmas — thanks to the Alaska Native Medical Campus’ Pediatric Christmas Project. By sewing quilts, kuspuks, and stockings for children at ANMC over the holidays, the Pediatric Christmas Project brings joy and Christmas spirit to the children, who are not able to spend the holidays at home. The event began 20 years ago, with a goal of creating a single quilt and stocking for the first boy and girl born in the new year at ANMC. Over the years, the event’s participation has grown significantly. This year, participants from Southcentral Foundation, Alaska Native Tribal Health Consortium, and the community gathered to complete nearly 30 projects in the span of just one day. Because of their generosity, dozens of children will receive gifts this holiday season.